We are always on call! Complete 24 hours a day, 7 days a week, 365 days a year emergency service. Give us a call or send us an email today! Trustworthy Technicians with years of experience. Our technicians are trained and certified to offer top notch service. Financing is available for all services. Contact one of our offices, or send over a quick email for more information. With almost 40 years in the heating and cooling business in the Quad Cities area, Kale Company Heating and Air Conditioning takes pride in our dedication to providing the best possible indoor weather solution for your home or business. 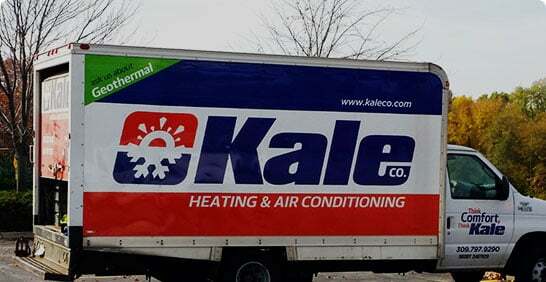 Kale Heating and Air Conditioning is a family-owned business, established in 1980 by Thomas Kale, Jr., owner and CEO. For nearly 40 years, we have serviced thousands of satisfied Quad City customers. We have a professionally trained staff with many years of service in AC and furnace repair and maintenance. Kale Heating and Air Conditioning is proud to provide the highest quality service for residential, commercial, and industrial customers with complete Sales, Maintenance, and Installation of quality heating, air conditioning, and air quality products.